U-boat is the anglicised version of the German word U-Boot [ˈuːboːt], a shortening of Unterseeboot, literally "undersea boat". While the German term refers to any submarine, the English one (in common with several other languages) refers specifically to military submarines operated by Germany, particularly in the First and Second World Wars. Although at times they were efficient fleet weapons against enemy naval warships, they were most effectively used in an economic warfare role (commerce raiding), enforcing a naval blockade against enemy shipping. The primary targets of the U-boat campaigns in both wars were the merchant convoys bringing supplies from Canada, the British Empire, and the United States to the United Kingdom and (during the Second World War) to the Soviet Union and the Allied territories in the Mediterranean. The first submarine built in Germany, the three-man Brandtaucher, sank to the bottom of Kiel harbor on 1 February 1851 during a test dive. The inventor and engineer Wilhelm Bauer had designed this vessel in 1850, and Schweffel & Howaldt constructed it in Kiel. Dredging operations in 1887 rediscovered Brandtaucher; it was raised and put on display in Germany. In February 1915, a submarine U-6 (Lepsius) was rammed and both periscopes were destroyed off Beachy Head by the collier SS Thordis commanded by Captain John Bell RNR after firing a torpedo. On 7 May 1915, SM U-20 sank the liner RMS Lusitania. 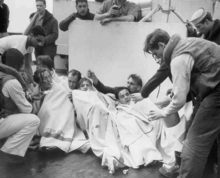 The sinking claimed 1,198 lives, 128 of them American civilians, and the attack of this unarmed civilian ship deeply shocked the Allies. According to the ship's manifest, Lusitania was carrying military cargo, though none of this information was relayed to the citizens of Britain and the United States who thought that the ship contained no ammunition or military weaponry whatsoever and it was an act of brutal murder. Munitions that it carried were thousands of crates full of ammunition for rifles, 3-inch artillery shells, and also various other standard ammunition used by infantry. The sinking of the Lusitania was widely used a propaganda against the German Empire and caused greater support for the war effort. A widespread reaction in the U.S was not seen until the sinking of the ferry SS Sussex. The sinking occurred in 1915 and the United States entered the war in 1917. Unrestricted submarine warfare in early 1917 was initially very successful, sinking a major part of Britain-bound shipping. Nevertheless, with the introduction of escorted convoys, shipping losses declined and in the end the German strategy failed to destroy sufficient Allied shipping. An armistice became effective on 11 November 1918 and all surviving German submarines were surrendered. 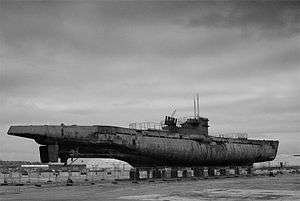 Of the 360 submarines that had been built, 178 were lost, but more than 11 million tons of shipping had been destroyed. During World War II, U-boat warfare was the major component of the Battle of the Atlantic, which lasted the duration of the war. 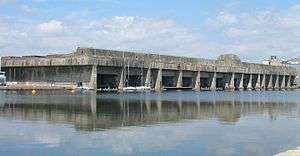 Germany had the largest submarine fleet in World War II, since the Treaty of Versailles had limited the surface navy of Germany to six battleships (of less than 10,000 tons each), six cruisers, and 12 destroyers. Prime Minister Winston Churchill wrote "The only thing that really frightened me during the war was the U-boat peril." In the early stages of the war the U-boats were extremely effective in destroying Allied shipping; initially in the mid-Atlantic where a large gap in air cover existed until 1942, when the tides changed. The trade in war supplies and food across the Atlantic was extensive, which was critical for Britain's survival. This continuous action became known as the Battle of the Atlantic, as the British developed technical defences such as ASDIC and radar, and the German U-boats responded by hunting in what were called "wolfpacks" where multiple submarines would stay close together, making it easier for them to sink a specific target. Later, when the United States entered the war, the U-boats ranged from the Atlantic coast of the United States and Canada to the Gulf of Mexico, and from the Arctic to the west and southern African coasts and even as far east as Penang. The U.S. military engaged in various tactics against German incursions in the Americas; these included military surveillance of foreign nations in Latin America, particularly in the Caribbean, to deter any local governments from supplying German U-boats. Because speed and range were severely limited underwater while running on battery power, U-boats were required to spend most of their time surfaced running on diesel engines, diving only when attacked or for rare daytime torpedo strikes. The more ship-like hull design reflects the fact that these were primarily surface vessels that could submerge when necessary. This contrasts with the cylindrical profile of modern nuclear submarines, which are more hydrodynamic underwater (where they spend the majority of their time), but less stable on the surface. While U-boats were faster on the surface than submerged, the opposite is generally true of modern submarines. The most common U-boat attack during the early years of the war was conducted on the surface and at night. This period, before the Allied forces developed truly effective antisubmarine warfare tactics, which included convoys, was referred to by German submariners as "die glückliche Zeit" or "the happy time." In practice, however, the depth-keeping equipment and magnetic and contact exploders were notoriously unreliable in the first eight months of the war. Torpedoes often ran at an improper depth, detonated prematurely, or failed to explode altogether—sometimes bouncing harmlessly off the hull of the target ship. This was most evident in Operation Weserübung, the invasion of Norway, where various skilled U-boat commanders failed to inflict damage on British transports and warships because of faulty torpedoes. The faults were largely due to a lack of testing. The magnetic detonator was sensitive to mechanical oscillations during the torpedo run, and at high latitudes, fluctuations in the Earth's magnetic field. These were eventually phased out, and the depth-keeping problem was solved by early 1942. During World War II, the Kriegsmarine produced many different types of U-boats as technology evolved. Most notable is the Type VII, known as the "workhorse" of the fleet, which was by far the most-produced type, and the Type IX boats, which were larger versions of the VII designed for long-range patrols, some traveling as far as Japan and the east coast of the United States. Throughout the war, an arms race evolved between the Allies and the Kriegsmarine, especially in detection and counterdetection. Sonar (ASDIC in Britain) allowed Allied warships to detect submerged U-boats (and vice versa) beyond visual range, but was not effective against a surfaced vessel; thus, early in the war, a U-boat at night or in bad weather was actually safer on the surface. Advancements in radar became particularly deadly for the U-boat crews, especially once aircraft-mounted units were developed. As a countermeasure, U-boats were fitted with radar warning receivers, to give them ample time to dive before the enemy closed in, as well as more anti aircraft guns. However, by early to mid-1943, the Allies switched to centimetric radar (unbeknownst to Germany), which rendered the radar detectors ineffective. U-boat radar systems were also developed, but many captains chose not to use them for fear of broadcasting their position to enemy patrols and lack of sufficient electronic countermeasures. 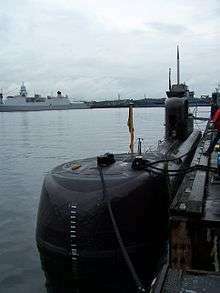 With the Danish government's purchase of two Type 205 boats, the German government realized the potential for the submarine as an export. Three of the improved Type 206 boats were sold to the Israeli Navy, becoming the Gal-class. The German Type 209 diesel-electric submarine was the most popular export-sales submarine in the world from the late 1960s into the first years of the 21st century. With a larger 1,000–1,500 tonne displacement, the class was very customizable and has seen service with 14 navies with 51 examples being built as of 2006. ↑ "U-boat". Online Etymology Dictionary. Retrieved 2012-06-22. ↑ Compare: Chaffin, Tom (2010). The H. L. Hunley: The Secret Hope of the Confederacy. Macmillan. p. 53. ISBN 9781429990356. Retrieved 2016-07-14. 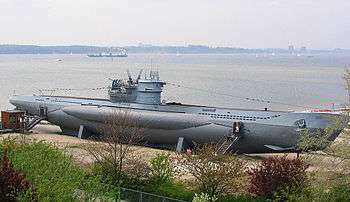 Bauer's boat made a promising start, diving in tests in the Baltic Sea's Bay of Kiel to depths of more than fifty feet. In 1851, however, during one of those tests, the boat malfunctioned. The Brandtaucher plunged fifty-four vertical feet and refused to ascend from the seafloor. Bauer and his crew - leaving their craft on the bottom - barely escaped with their lives. ↑ "Archived copy". Archived from the original on 27 December 2008. Retrieved 2 November 2008. ↑ "WWI U-Boats U-17". Uboat.net. Retrieved 2008-03-24. ↑ "Full text of "A North Sea diary, 1914-1918 / Commander Stephen King-Hall"".